There’s been a whole lot of activity around the studio in the last couple of weeks. I’ve made a batch of felt soaps, coasters, geodes, flowers and super fluffy sheepskins. 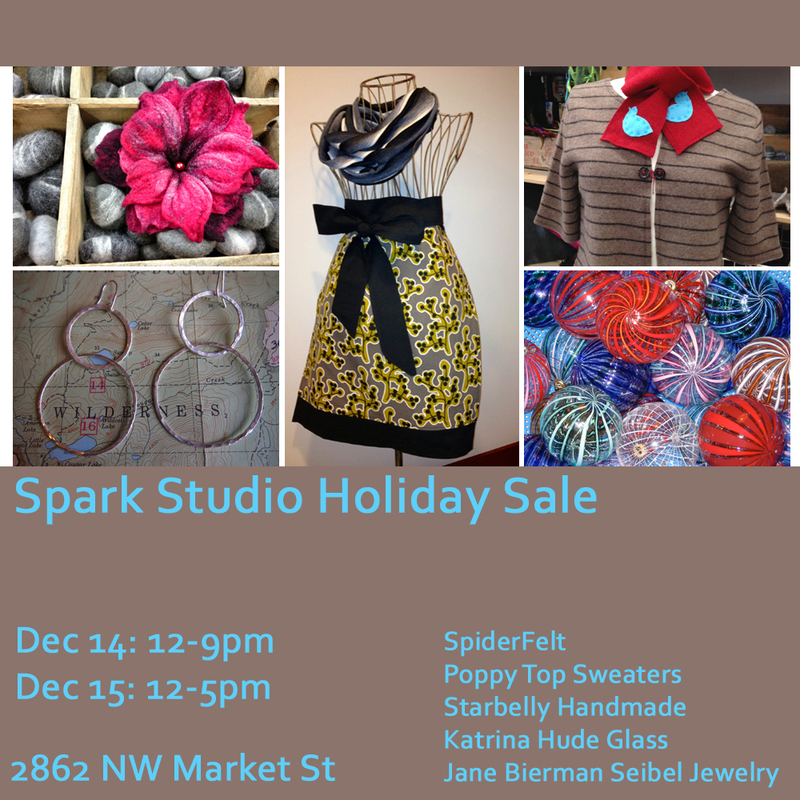 My studio mates have been sewing sweaters and pounding silver hoops. We’re excited to include the work of Starbelly Handmade and handblown glass of Katrina Hude in our sale this year. 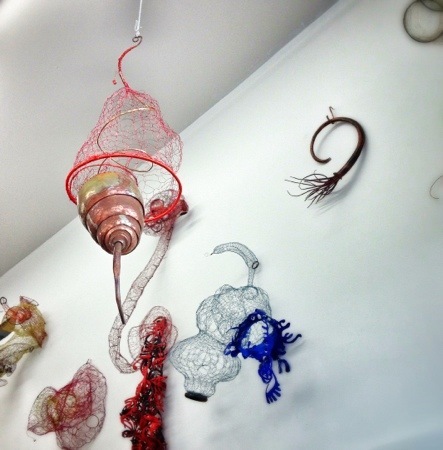 The walls are filled with the dynamic wire and copper work of sculptor Amy Hamblin. I purchased several pieces of Amy’s work last weekend at her open studio sale. I will definitely be wearing them this weekend. 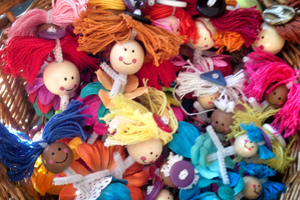 One of my talented students, Daisy, has crafted a basket full of adorable flower fairies. The proceeds from the sale of these cuties will support the Feral Cat Spay/Neuter Project. We packed up the work tables, scooted storage bins, swept floors, draped and arranged displays yesterday. The studio sparkles. It’s going to be a fantastic weekend. How about I give you a little backstory before the cut and dry details? Why should you care about Reid Jamieson? Why would I want him to play at my studio? Last September, I decided the best way to celebrate my 40th birthday was with music and theater. Corin Raymond was coming to Vancouver, touring his show Bookworm and the same weekend Lindsay Robertson was performing with several other musicians at the cozy Cafe Montmartre. What a way to celebrate! Some people hike Kilimanjaro to mark milestones. For me, it doesn’t get any better than a concert and a play while staying with my oldest friend at her funky art-filled home. That night, I got a taste of Reid’s music as he backed up Lindsay on a couple songs and performed Rail (see the video below). Chatting with him after the concert, I found he was doing a house concert in Seattle in October. When the day came around, I wasn’t sure what to expect (sometimes the intimacy of a house concert is intimidating), but I went out into the dark stormy night on my own. What an amazing night. Reid performed two sets with his songwriting partner, Carolyn Victoria Mill. They bantered between songs, shared the stories behind the songs and in short order wrapped the audience around their fingers. We were held captive, as a collective body. For the next week, I played the three albums purchased at the concert non-stop (you can listen to them all on Soundcloud, starting with this set of besties – right now I have “Lost” looping in my brain as the best earworm ever). I couldn’t stop gushing to everyone I met about how magical the night was. Reid and Carolyn are charismatic, charming, and magnetic. Their voices are dreamy together. The vibrations resonated through the floor, and up the chair legs into my seat. It wasn’t long before I started scheming about getting them back to play on my turf. WHY: “Gorgeous, sun-struck acoustic soul” – Globe & Mail. Vancouver’s Reid Jamieson shines his light with an incredible voice, therapeutic lyrics, and a magical way with melodies. A regular on CBC/NPR’s Vinyl Cafe, and winner of the grand prize for folk in the John Lennon Songwriting Contest, Reid is well known for his compelling covers, impressive guitar playing, and rather moving original songs. A male kd Lang, or Roy Orbison’s long lost son – the comparisons continue to come in but Reid remains uniquely himself. You won’t want to miss this very special performance in such an intimate and inspiring venue. 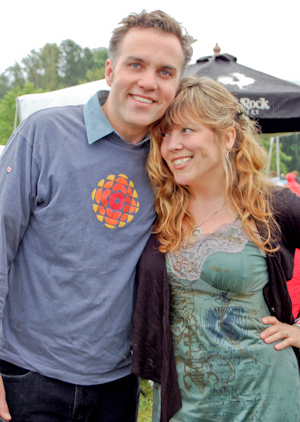 Reid will be accompanied by his wife and songwriting partner CVM. Join them for an entertaining evening of stories and song.